RRB ALP & Technician Posts Recruitment Exam Results 2019: Railway Recruitment Board has released the RRB ALP & Technician Exam 2018 result on the regional websites. Candidates who have appeared for the examination can check their result, scores and cut offs through the direct links provided in websites. The results are available for RRB Chennai, RRB Bangalore, RRB Kolkata, RRB Ajmer, RRB Secunderabad, RRB Bhopal, RRB Allahabad and few others. RRB ALP & Technician Exam 2018 result for RRB Mumbai, RRB Patna, RRB Ranchi, RRB Chandigarh are yet to be declared. Important instructions for candidates along with direct link to check RRB ALP Result 2018 is provided below. The results were made available on the regional websites. As many as 8 times the revised vacancy list for ALP posts have been shortlisted for the next stage of recruitment which is the Aptitude Test. The Aptitude Test would also be a Computer Based Test and is scheduled to be conducted on April 16, 2019. 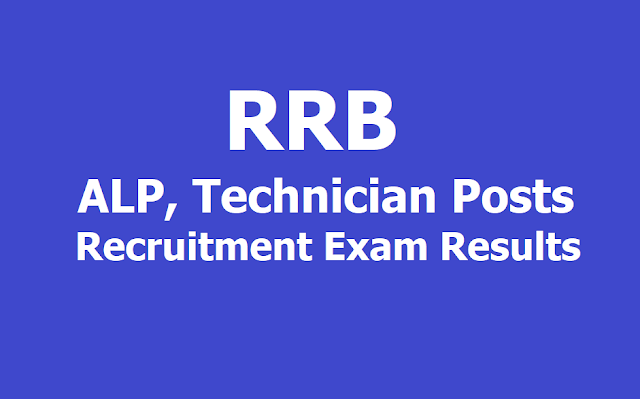 RRB ALP Technician CBT 2 Answer Key 2019 have also been released by the Railway Recruitment Boards (RRBs) for the second stage CBT for the posts of Assistant Loco Pilot (ALP) and Technician posts. RRB’s had released the provisional scores for the candidates on March 23, 2019. Objections were received and the final scores along with the status for next round have now been released on the regional websites. The qualifying cut off for RRB ALP CBT 2 exam is 35. Regional Cut off, however is different and available on regional websites. Direct links to regional websites are provided below. The railway recruitment board (RRB) has declared the results for ALP technician 2nd computer based test (CBT) on its official websites. The exam was conducted on January 21, 22, 23 and February 8, 2019. Qualified candidates will have to appear for aptitude test. Candidates can now view their individual scores and their shortlisting status for Computer Based Aptitude Test by logging in through the link provided on the official website of RRBs. They will have to key in their registration number and date of birth. This facility will be available only up to April 16. 1. The examination is scheduled to be conducted on April 16, 2019 in Computer Based Test Format. 2. Aptitude Test would consist of a Test Battery which would have 5 tests. Candidates have to score a minimum T score of 42 in each of the 5 sets of the test battery to qualify for ALP or Assistant Loco Pilot. 3. There is no relaxation for any candidates regarding the examination. 4. There is no negative marking in the Aptitude Test. Also, guidelines and a sample mock test would be made available on regional RRB websites from April 10, 2019. 5. Candidates who have been shortlisted for the CBT 2 are required to produce a Vision Certificate in the prescribed format for A1 Standard as per Annexure VI of detailed CEN 01/2018. The certificate has to be in original. Candidates failing to provide the same would not be allowed to appear in the Aptitude Test. 6. To check your result, simply go to the regional website and click on the link for the RRB ALP CBT 2 Result and Cut off documents. What after RRB ALP CBT 2 Result 2019? A total of 64,371 posts are to be filled by this recruitment drive. Note: Candidates are advised to keep a track on the RRB's Website for latest updates.